Bohemian Rhapsody (Movie) Review: Rami Malek hits all the high notes in decent Queen biopic – AiPT! Rami Malek channels Freddie Mercury in an amazing performance. Queen is one of the most revered rock bands in music history. They recorded a number of hit albums, released one of the most well known singles of all time, popularized the music video, and played one of the greatest live sets ever. Brian May is a guitar legend while Freddie Mercury may be the greatest front man ever. Bohemian Rhapsody is a biopic that explores the career of Queen with a focus on their charismatic lead singer. Rami Malek seems to have been the perfect casting choice for Mercury. Malek has shown his acting range in the television series Mr. Robot, but for the most part has had smaller roles on the big screen. (He did star in 2016’s Buster’s Mal Heart, but this was a small film.) In Bohemian Rhapsody, Malek is required to be on screen a majority of the time and ends up stealing the show. To the public, Mercury was the charismatic leader of one of the world’s biggest bands. Bohemian Rhapsody shows this side of the singer, but also goes backstage and provides a more personal glimpse in to Mercury’s life. This requires a wide array of emotions from Malek, who is up to the task. Watching the quick witted and in your face Mercury is funny but watching him alone with his girlfriend Mary (Lucy Boynton) sheds the most light as to what kind of person Mercury was. It is during these moments that the audience is seeing the real Mercury. There is a innocent, playful, and even shy man who is willing to let down all of his defenses in front of the person he loves. The intimacy they share is obvious and it comes as no surprise that they remained life long friends. Mercury was one of the biggest rock stars in the world, but the film does a great job of humanizing him in these intimate moments. Unfortunately, the film’s pacing brings Bohemian Rhapsody down. The movie clocks in at a little over two hours and still seems rushed. The opening is a great example. The audience is briefly introduced to Mercury. The young man meets his future Queen band mates, they proceed to record a demo, and get discovered by a major label all within the first thirty minuets. It is as if the movie is in a rush to get to its finale. There is nothing wrong with this if the movie was just a collection of Queen’s greatest hits leading up to their memorable Live Aid performance. The problem happens when the movie slows down for a bit and tries to tell more of a story. Since no time has been spent building any character (including Mercury; it is Malek’s performance that does the heavy lifting here), there is no reason to care about what is happening. The only reason the audience knows how to react is due to the cliched writing. The soundtrack for Bohemian Rhapsody is amazing. A person does not have to be a Queen fan to recognize their greatest hits. Obviously, the movie is filled with their most well known songs. It is incredibly hard not to sing along while watching and impossible not to tap your feet. Adding to the great music is watching Malek channel Mercury in the live performances. Bohemian Rhapsody is a one note movie. 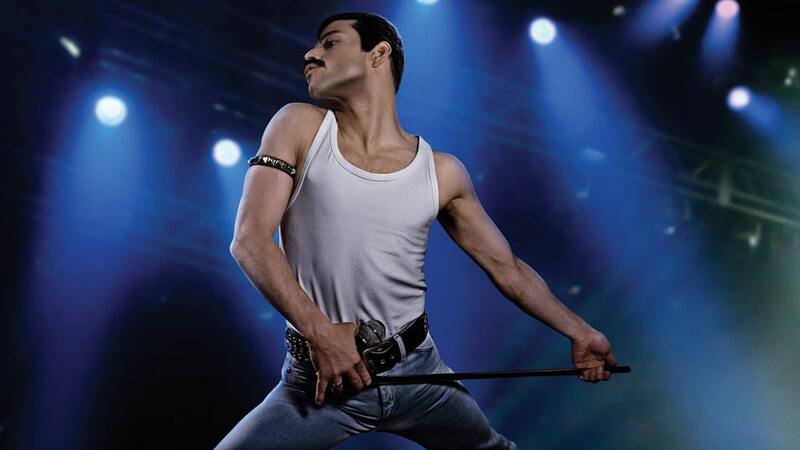 Rami Malek delivers an outstanding performance that will lead one to believe he is the biggest Freddie Mercury fan ever. The familiar music of Queen will also be a plus for many. Ironically, lazy writing and a lack of imagination prevent the film from being anything more than just a fun cliche. A strong performance from Rami Malek saves an otherwise generic movie. Even then, he is given little to work with.